EGYPT Egypt: Morsi trial a “sign of change for the country"
Egypt: Morsi trial a “sign of change for the country"
Fr. Rafic Greiche, spokesman for the Egyptian Catholic Church, emphasizes the desire of the people to turn the page after the recent Islamist past. Mina Thabet , president of the Christian Maspero Youth Union , speaks of a "double Egyptian Arab Spring ." In three years the leaders of two opposing regimes have ended up on trial. 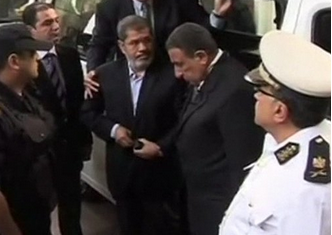 Morsi’s day in court postponed to February 2014. Cairo (AsiaNews) - In less than three years, Egypt has witnessed two popular revolutions that have brought millions of people to the streets and the trial of two presidents from opposing factions. The first day of the trial against Mohamed Morsi and 14 Islamist leaders is a "small step forward for the country, Fr . Rafic Greiche , a spokesman for the Egyptian Catholic Church , and Mina Thabet , president of the Maspero Youth Union tell AsiaNews. Fr. Rafic Greiche argues that "the trial of Mohamed Morsi is a sign of change for Egypt. The people want to close the chapter of its recent Islamist past and turn the page definitively not through violence, but through justice". The Islamists again took to the streets to support their leaders surrounding the Supreme Court and organizing demonstrations around the country. The priest notes that on this occasion the wrath of the followers of Morsi was not stopped by the police deployed in front of the court or government supporters of the military, but by hundreds of Egyptians tired of the tension and hatred that has hit the country over three years. Mina Thabet, a young Christian and president of the Maspero Youth Union, says the Islamists will use any available means to defend their leaders, including lying to the media and threats and violence against minorities, but such an attitude "has further damaged the credibility of the Muslim Brotherhood". Together with Tamarud ( Rebels ), the Maspero Youth Union is one of the organizations which on June 30 brought 30 million people to the streets to demand the resignation of Morsi, accused of trying to transform the country into an Islamic dictatorship . "The Islamists - says Thabet - are answering for their actions before a court. The entire country is a witness to their violence." The Christian leader said that "by opposing to justice, the Islamists continue to deny the facts. In a civilized country anyone can be brought before a court". "Since 2011 - he adds - two presidents were jailed due to popular revolts. This is a historical fact in Egypt and throughout the Middle East." Thabet believes "a new generation made ​​up of Christians and Muslims was born on the streets , which does not accept any negotiations with respect to human rights, which does not want to bow to political strategies but to try to build a new country." The President of the Maspero Youth Union says the real challenge that demands the urgent focus of the political and revolutionary movements is the future Constitution. The trial against Mohamed Morsi and other 14 members of the Muslim Brotherhood opened this morning at 10:30 and ended around 13.00 . The judges have fixed the next hearing for February 8, 2014. AsiaNews sources present at the trial say that the president appeared before the court in civilian clothes, but was forced by the court to wear the prison uniform, as provided by law. The Islamist leader rejected all allegations against him claiming to be "the only legitimate president of Egypt". Morsi and the other 14 Islamists on trial shouted slogans against the military , the new government and the judiciary throughout the entire session. Fearing clashes between police and Islamists many public and private schools in Cairo were closed . In the district of Minya (Upper Egypt) , the most affected by the anti-Christian attacks of 14 August , local churches have ordered the closure of all schools for at least two days. To increase the climate of tension, the Muslim Brotherhood spread false rumors about the involvement of Christian judges in the trial of former President Morsi .